I will admit that up until now I have been a bit of a Scrooge. Don’t get me wrong, I absolutely love Christmas, and not having a proper Christmas last year as we were travelling around India, means I’m looking forward to it a whole lot more than usual this year. But seeing Christmas gifts starting to be sold in shops, hearing Christmas songs on the radio, walking past houses twinkling with lights, and being asked about my plans for Christmas in October and November, well that is just way too far in advance for my liking. But now the time is getting closer; December has arrived and so I’m just as excitable as everyone else – cue decking the house out in Christmas decorations, belting out Mariah Carey’s All I Want For Christmas and eating a huge amount of strawberry Quality Street (because we all know the strawberry ones are the best). I’ve gone from Ebenezer Scrooge to Will Ferrell’s twin in Elf in the space of a few days! So, to get us in the proper Christmassy spirit, we had a festive day out in London this weekend. Despite the streets heaving with people doing their Christmas shopping and enjoying the sights, the city never fails to be beautiful at this time of year and any other Scrooges around cannot fail to not be filled with Christmas cheer. Bright sparkly lights line the streets everywhere from the lights on Oxford Street hanging over eager shoppers to the giant reindeer and Christmas tree in Covent Garden. Christmas markets pop up all over London and we wandered around the little wooden stalls taking in the huge array of decorations, gifts and little trinkets being sold with the obligatory cup of mulled cider (so much tastier than mulled wine) to warm us up. 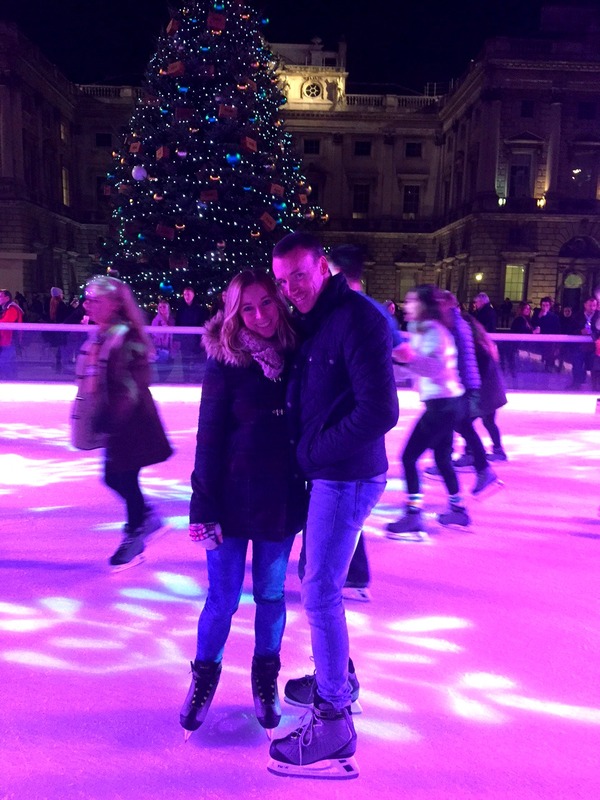 A must-do activity in London at this time of year has to be ice skating at one of the many gorgeous ice rinks. 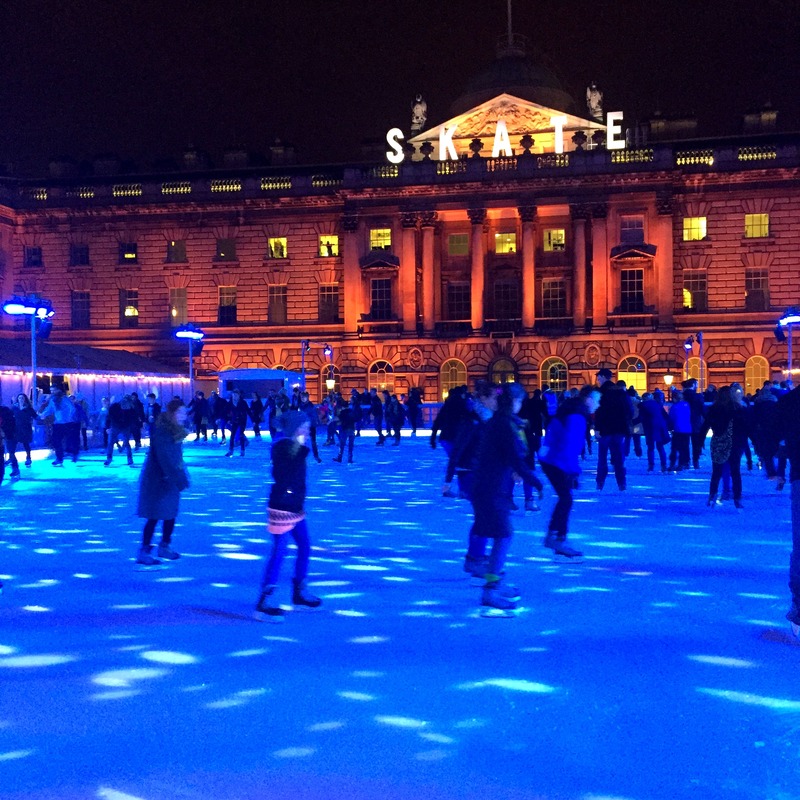 Somerset House is one of my firm favourites with its giant Christmas tree, colourful ice rink and music that makes you think you’re in Dancing on Ice. Although there’d be no chance of me being on that show because I am completely and utterly useless and yet every year I still insist on going ice skating! This time I forced myself to be a bit braver; or rather Alex forced me to be a bit braver by pulling me away from the sides and holding my hand while we skated around the middle along with everyone else. As long as I had something to hold on to I was fine and despite the occasional wobble I enjoyed it so much more this time round. 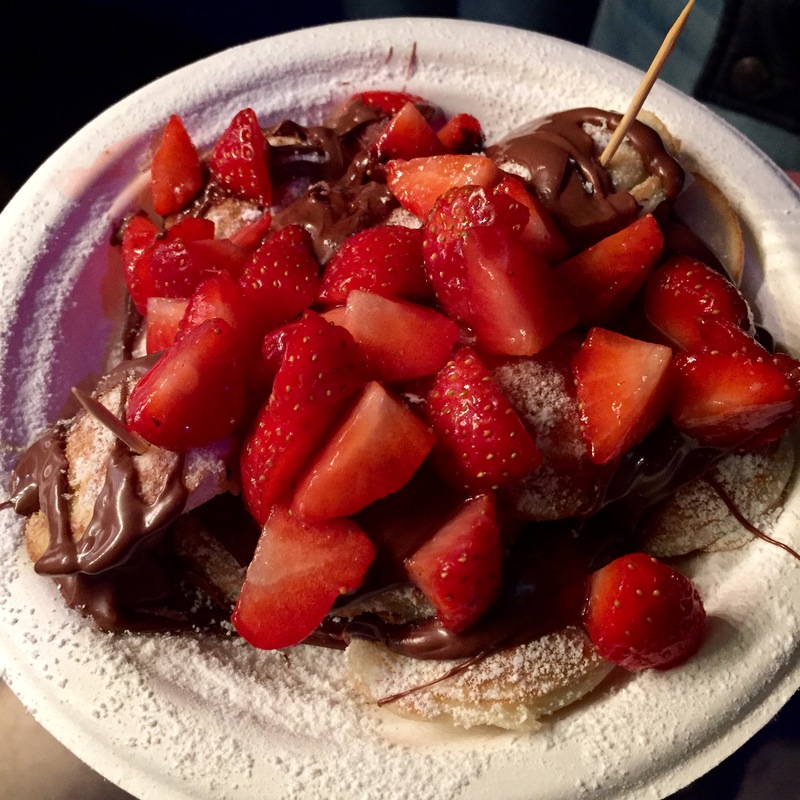 Winter Wonderland is of course another must-do for the festive season and everyone, including us this coming weekend, flocks there for its colourful markets, delicious street food and ridiculously overpriced rides. We went ice skating here a couple of years ago and it is unbelievably pretty, with twinkly lights hanging over the rink and a Christmas tree in the middle for the skaters to twirl around (or for me to wobble around). There is so much going on in London around Christmas time that it’s impossible to fit it all in in the short festive season. But from being in India last year I’ve learnt that home is the only place to be at Christmas and, until the last decoration is grudgingly pulled down and the last crumb of mince pie gets eaten up, I’ll definitely be making the most of the festivities. 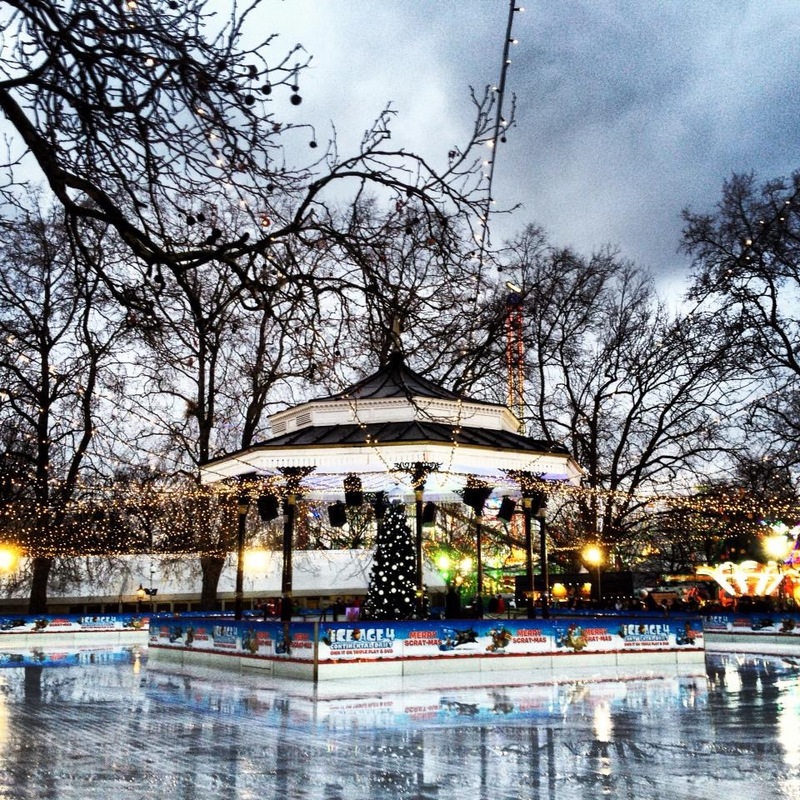 What’s your favourite thing to do in London or your home city this Christmas? 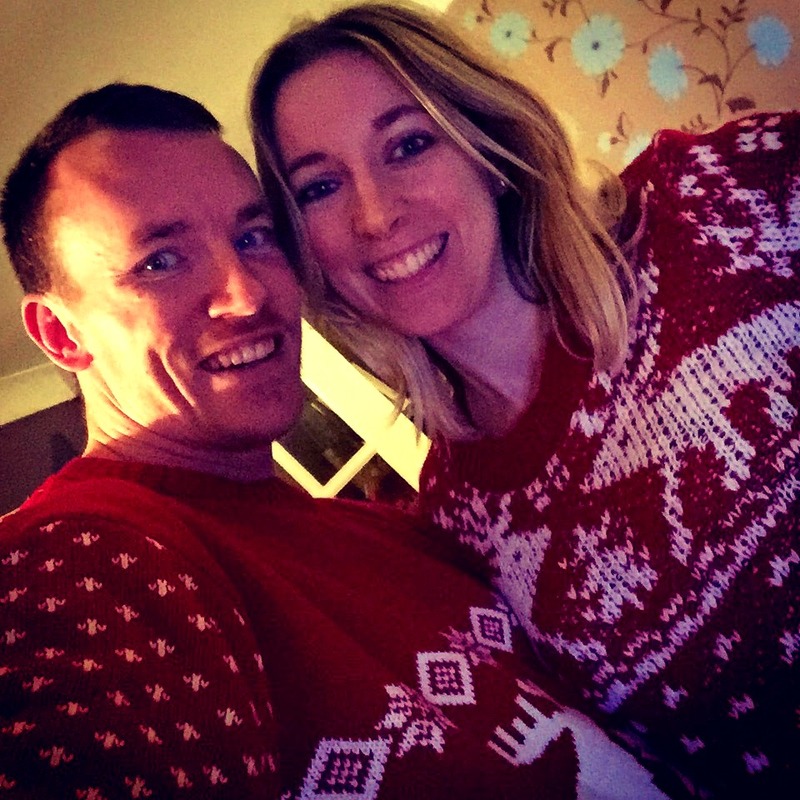 Loved your blog – I’m going to book train tickets right now – to London – you’ve made me feel v festive! And I need to see when Elf is on TV. I love Elf! London looks so gorgeous at Christmas time! 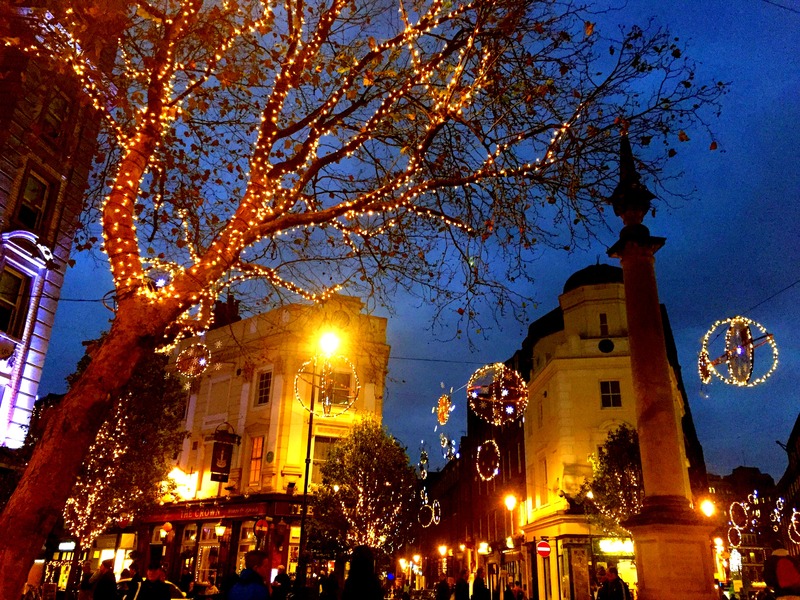 A majority of the bloggers in my network seem to be London / UK based and my feed is full of Christmas in London posts! I would give anything to be there myself. But how lovely, Ayla. Looks like you guys are having a blast 🙂 Happy Holidays to you! I miss Christmas in London so much! 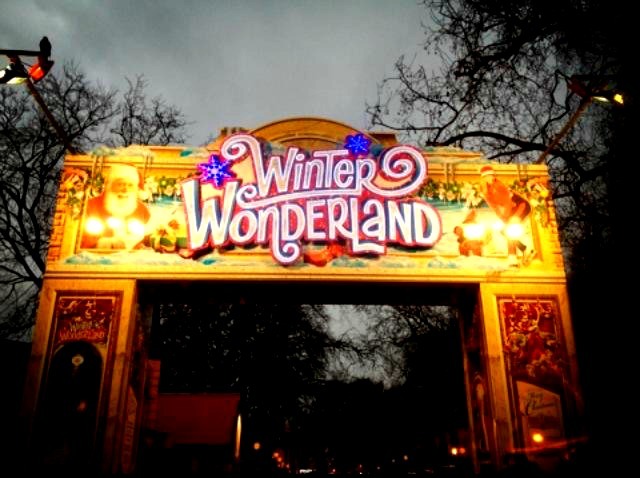 Winter wonderland was a must every year and the markets on South Bank! And watching Christmas movies all day long on Sky! Turkey has nothing of that sadly. I wasn’t as impressed with the Southbank Christmas markets this year – seem to be a lot smaller and not much there. Winter Wonderland should be a whole lot more fun though! I’ve never actually fallen over so maybe if I was just a little braver I actually wouldn’t be too bad at it! Haha I really need to see this film again – it has to be on tv sometime soon right?! lovely to see london so christmassy even tho this has made me even more home sick, but this time next year i’ll be home for xmas – cant wait! Aww well sorry for making you homesick but at least it gives you lots to look forward to next year 🙂 Is it very Christmassy out there or not as much as London?